Over the river and through the woods…. | RV There Yet? 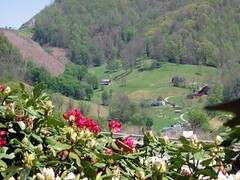 To Johnson City we went! 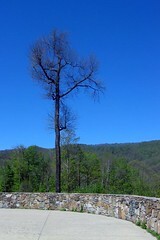 The river was the Savannah and the woods were the beautiful mountains along US26 between Asheville and Johnson City. It was a glorious drive both going north on Sunday afternoon and heading south on Tuesday afternoon. Our assignment – reassemble 12 office cubicles in the STL North American headquarters. Since the guys had taken them all apart, they had a pretty good handle on putting them back together again. We ladies were the gophers and the holders and the pushers and the carriers. We got a pretty good rhythm down and with the help of one other guy at the warehouse managed to get the job done by Tuesday lunch time. For those of you who call a cubicle home during the day – we now have intimate knowledge of the ins and outs of those efficient spaces. And while they seemed pretty sterile while we were putting them up, but by the next day they had taken on the personality of each occupant. Everyone seemed pretty happy with the end results, and we were pleased with our little four state road trip (that someone else paid for!). 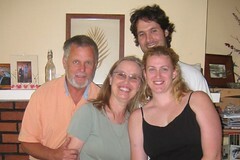 On our way north we stopped for a quick visit with my nephew Jonathan and his wife Emily in Asheville. We hadn’t seen them in 2 ½ years – so it was a good, though short, visit. 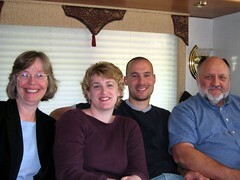 Here is a picture of them (with his mom & dad) taken in November 2004. And here is shot of them with us taken on Sunday. I don’t think I have EVER seen Jon with that much hair (and I don’t think his dad has either!). What a sweet visit we had! Although our time in Johnson City was spent mostly at work, we did enjoy a nice dinner out (Cheddars Café – new to us, and very good) and got in a little shopping. We were still on the hunt for the replacement coffee maker (we’d been brewing our morning java into a Pyrex 4 cup measure), and I’m pleased to announce that Best Buy came through with a great “open box” deal on a nice Cuisinart Thermal Coffee Maker. Sweet. 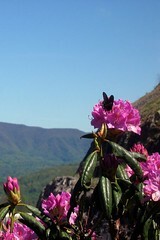 And the scenery – WOW! Even though it was interstate most of the way, it was still a delight. 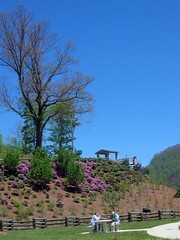 Here are some of my favorite shots – most taken from the NC rest stop (heading south) or a scenic overlook also in NC. 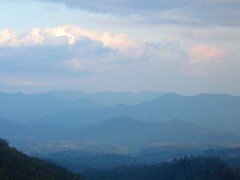 But the smoky mountains one was taken out of the moving car through an open window. I love the blue blue sky on most of them, but the hazy mountain one is probably my favorite. All in all, a very fun adventure.